What's this? Is that supposed to be me? I don't recall ever having eaten that - what kind of trickery is this?! Have you ever vividly remembered what you did in a particular instance, only to have someone smugly show you actual photographs that clearly proves that something entirely different happened instead? Don’t worry. You’re not going mad – it’s just another weird brain anomaly. Even though your memories might seem undisputable and absolute, they are in fact just strings of reference points and associations. When you later want to recall what happened, your brain will look for any relevant references and string them together to form the memory we experience. Contrary to popular belief, we don’t have actual voice and video recordings in our brains of all that we’ve ever seen and heard. This obviously leaves our memories wide open for interpretations and amendments at the point of recalling, and you might find yourself remembering the same things slightly differently at different points in your life. As an example, my childhood memories of growing up in Stockholm, Sweden have been amended in the last few years to now be in English, even though I know for a fact the were in Swedish before I moved to the UK. Oh come ON! Now you're just making stuff up - I think I'd remember being molested by a Great white pelican! This is strangely unsettling, as my whole view on my childhood experiences is called into question. In the end though, they still seem to be fairly correct, they’ve just been translated into English (and it is kind of funny to remember things said in English by people who can’t actually speak a word of English in real life!). And this is kind of the point: your memories are not a record of real life. They are just a record of what you’ve experienced and how you felt about it at the time. Memories are consequently not suitable as evidence in a court of law, and the whole idea of eye witnesses should be carefully reconsidered. I know this concept is rather unsettling and it might be difficult to accept, but the fact of the matter is: what you remember might not actually have happened. At least not the way you remember it. Which is probably why we started taking minutes at important meetings. So the next time you’re about to confidently state ‘I think I know what I said!‘, stop. Think. And remember that you probably don’t.. I would like to have had remembered reading this. However, I have been constructing my own past experiences for a while now. This blog post is in direct conflict of my new memories of being a teen idol rock star. Sorry. Oh no! Does that mean I will now cease to exist? Damn, I had things to do, as well..
I’ve read somewhere on the interwebz that you actually rewrite your memories every time every time you remember something. Remembering something means reenactng it in your head, and what your brain stores afterwards is the reenactement, not the original memory. PS: Sorry for posting on such an old thread. Interesting! And that would certainly explain how memories tend to ‘drift’ with time, and how people, when trying to remember something dramatic, always seem to have very distorted memories. The more dramatic the experience, the more we would go back to our memory to process what’s happened, and the more distorted our memory would become. Don’t be sorry! I love getting comments on my posts, and it’s never too late! I’ve been looking at this baby picture for the past ten minutes trying to figure out if it’s really you or just some baby picture of some random kid you pulled from the internets. I’ve decided it’s really you. How’d I do? The deciding factor for me was the little Andreas-scowl. 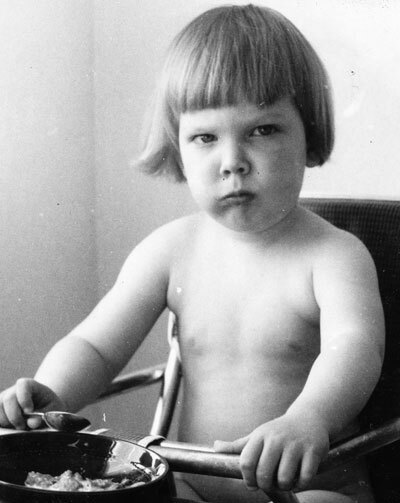 Which, if it ISN’T you, well, this photo-kid has a very Andreas-ish scowl about him. Although it totally does, doesn’t it? Stupid brain. WHEN DID YOU GET TO TOUCH A PELICAN? I’m the most envious right now. Yes it is me. Apparently. And you’re right; I’ve got my scowl down to a tee (and very much like what little Baby Boy is doing already so it seems to be genetic). Thank you! Yes, our brains lie all the time. Often about chocolate. 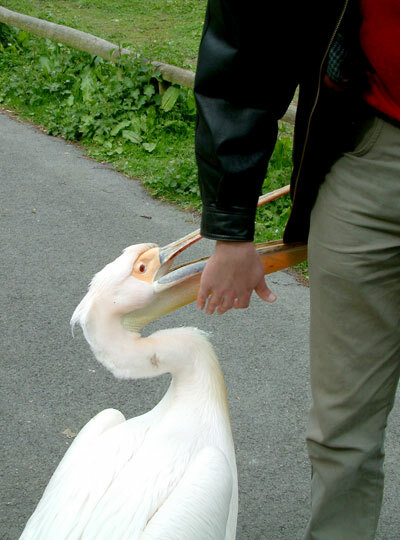 The pelican is from that magical zoo in the Isle of Man, where the animals roam free. Pelicans are the most cool, and I so want one as a pet. Their beaks are all leathery and rubbery, except the tip which is hard like a tooth. Argh, that Isle of Man zoo. Someday, SOMEDAY, I will go to that zoo. I will touch so many animals. ALL THE ANIMALS. I love that Baby Boy is making your facial expressions already. I can’t wait to see him grow up. What will he look like, I wonder? I’m the most curious. And no, it doesn’t make you sound like a weirdo, with a jar of eyes you’ve collected, hidden in the basement. Not at all. We’re all wondering that. Hopefully he’ll look like Fiancée, but as long as he’s healthy it doesn’t matter I guess. No, but seriously, can’t you see that? Like, if a friend puts up a baby picture, and you look at it, you can still see your friend in there, around the eyes? Am I the only one who does this? Probably. I’m willing to accept my weirdness. And you stop it, you’re very handsome and you always SAY you’re not but you ARE. *stern look* If Baby Boy looks like you he’d be VERY LUCKY. And I’m sure Fiancée would agree with me. Dead animals don’t smell of death, at least not to begin with. Of course, after a while they do start to smell, but that’s what we’ve got freezers for. And I couldn’t possible comment on my alleged handsomeness; I’d either end up disagreeing with a lady or indulge in self-promotion; neither of which is proper conduct of a gentleman.